Create a unique look of your home with the Storage Cubes. They come in different colors, shapes and materials fitting everyone’s needs. Today, we take a closer look at five different Storage Cubes that will help you organize your home and add a bit of color-pop and design at the same time. While you can use storage cubes to hold pretty much anything, we also recommend that you read our larger collection of home storage ideas. If you feel like you need to be more organized and store your things in separate compartments, take a look at the Sodynee Foldable Cloth Storage Cube Drawers. This set comes with six cubes and they come flattened in a box. The Storage Cubes are made of nice heavy weight fabric. The cloth covered cardboard flip-down bottom adds stability and strength for moving the cube in and out of your storage area. 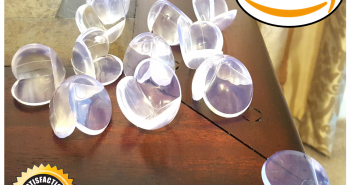 They are sturdy enough to hold a lot of smaller toys or anything you need. The zig zag pattern makes it unique from plain solid colors and really stands out. I like the fact that the sides are hard enough to hold a lot of things without poking through and I like the matching bottom insert that gives it strength. They each fit in the shelf well with room to spare and the handle makes it easy to pull out and put back. If you have a cubby style book shelf you can put them in that, but you can also arrange them in different areas around the home. A set of these would be great to have in the bathroom closet, to sort and organize all the different products you’ve got there. This set of 6 drawers will definitely keeps things organized and tidy around the house and will give you a beautiful pop of color. Overall a great product. The Sodynee foldable Storage Cubes are extremely versatile, practical, useable, easy to assemble, and the price is on the money. Check out the Sodynee Foldable Cloth Storage Cube Drawers here. 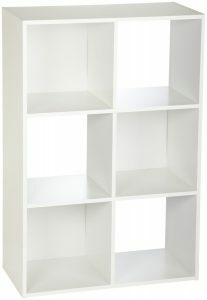 The ClosetMaid Cubeicals Mini 6-Cube Organizer is a great little cubby. It is small, but it is handy. It will work great hanged on the wall in your children’s room, over a toilet, holding shoe boxes, to make “shelves” in a TV cabinet or as an excellent cd rack. The size is perfect and it includes the wall mounting brackets. 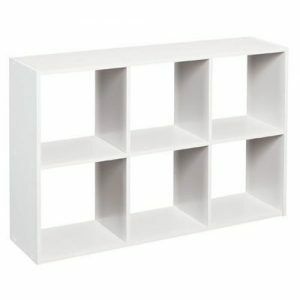 The Mini 6-Cube Organizer is very easy to assemble and I love that it includes wall mounts as well. The instructions are very clear and easy to follow, and all of the elements are included. It has glue, screws, screw covers, dowell pins and brackets to hold it if you want to mount it on the wall. For the price, you definitely can’ t beat these. They are sturdy and great for displaying things or storing them. It should take you around 15 minutes of your time from assembly to mounting, all you need is a hand screw driver. People usually get the mini storage drawers that fit in the cubbies and come in adorable colors. These Storage Cubeicals will look great in your home, you can get as many as you need or you might even decide to get them as a gift for someone special. Check out the ClosetMaid Cubeicals Mini 6-Cube Organizer here. The same manufacturer that made those cute little Mini Cubeicals offers a bigger version of the same product. If you’re looking for an easy way to organize your room, this ClosetMaid 6-Cube Organizer will fit the bill. You can place it under a window as a good way to utilize otherwise wasted space. The composite wood feels sturdy, and the overall construction feels strong. It isn’t wobbly at all. The assembly is also very easy. The instructions are clear and you won’t have any problems putting this together by yourself. The only tools you will need are a hammer and a screwdriver. You could probably put it together in less than 30 minutes. It is actually fun putting it together if you enjoy doing hands-on crafty stuff. A thing to note is that the back panels aren’t made of wood and are actually cardboard that’s been painted black. This definitely keeps the cost down, plus you wouldn’t notice it in a room since it’s in shadow anyway. I think the fabric drawers are a great addition to this bookcase, but are not necessary to make full use of it. Still, if you can get them I’d recommend them, as they really look nice with the case. So if you want an easy, nice looking case that just works and holds all your stuff, I’d heartily recommend this one. Unit can be used horizontally or vertically. Check out the ClosetMaid 6-Cube Organizer here. If you need Storage Cubes that are quick to assemble, light and easily movable take a look at the SONGMICS 6-Cube Closet Organizer. It will help you keep your home neat, tidy and organized. The tier design looks cool and has many uses. 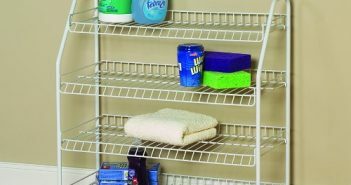 It is great for creating more organization/storage space. Put it inside your closet to arrange folded clothes like t-shirts, use it in the hallway or bedroom. It looks great, and is very versatile (you can build in in any shape you want). Definitely holds more than you think it will, including books and heavy beauty supplies. These Tiered Storage Cubes are surprisingly easy to put together, the instructions are very helpful and clear. It should take you about 10 minutes to unbox it and get it up. After it’s put together it’s pretty sturdy but still super lightweight. I honestly believe that everyone should have one of these in their homes. Check out the SONGMICS 6-Cube Closet Organizer here. Save space with an eye-catching and stylish rotating storage solution for your entire media collection. 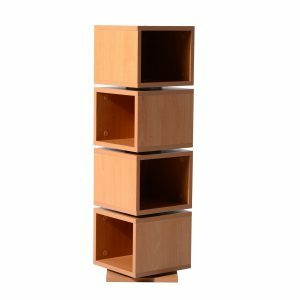 The HomCom 4-Tier Rotating Cube Media Tower – Beech Wood holds CDs, DVDs, Blu-Ray discs or video games and once you have them there it is super easy to adjust them since the separate parts are rotating. It has a large storage capacity and will definitely add a unique look to your living space with the eye-popping design. It will save you space both with the media it holds and in the design of the unit itself. These Storage Cubes are durable and sturdy, yet lightweight and portable. 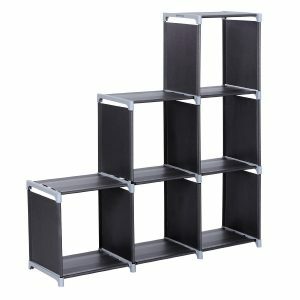 They are very easy to assemble and their unique characteristic of both blending in and standing out makes it an ideal choice for all of your storage needs. Check out this HomCom 4-Tier Rotating Cube Media Tower – Beech Wood here. Every home or office needs that perfect storage solution to eliminate the clutter and hopefully we fixed that problem today. Walk through your front door into a stress-free, organized oasis. 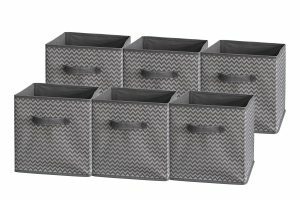 These 5 Storage Cubes are a great way to hold and display decorative items, hobbies, toys, media and office supplies. If you’re looking for non-cubical home storage ideas, check out the link!